Last week I had the honor of being a guest blogger over at Happy Hour Projects. Here is the post I shared over there. Have a wonderful Wednesday! 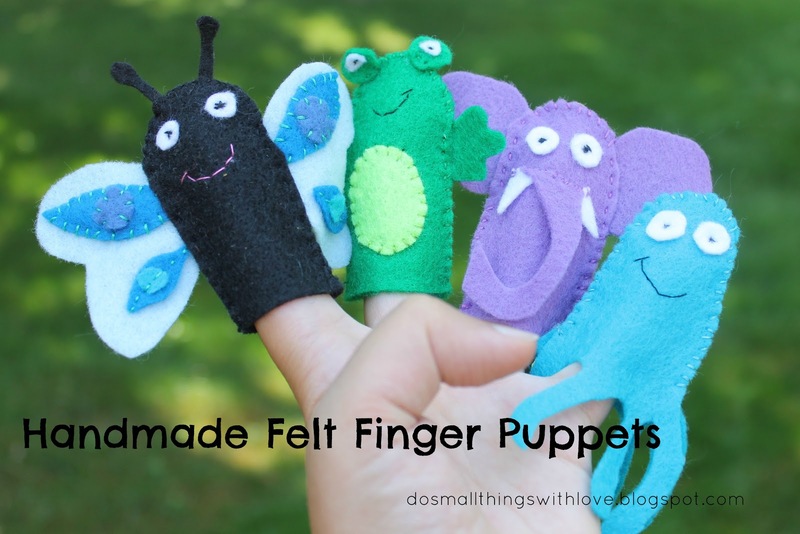 Felt finger puppets are easy to make and, once you get the hang of it, can easily be made in about 20 minutes. I (like usual) got a little carried away and have 17 different finger puppets in my collection already! There really is no limit to the characters that you can transform into felty-finger-puppety-fun! (optional) Simple cartoon images of the characters you are creating. This will help you figure out the simplified features to give you puppets. 1. Using your finger, create a “pattern” for the body of your puppets, so they are all about the same size. Draw a line around your finger with about 1cm on all sides. Stop just below your second knuckle. 2. Cut out the various pieces need, including two body pieces. Have fun here! Finger puppets are not meant to be perfect or anatomically correct. Find a helpful cartoon image as a guide, if needed, and cut away! 3. 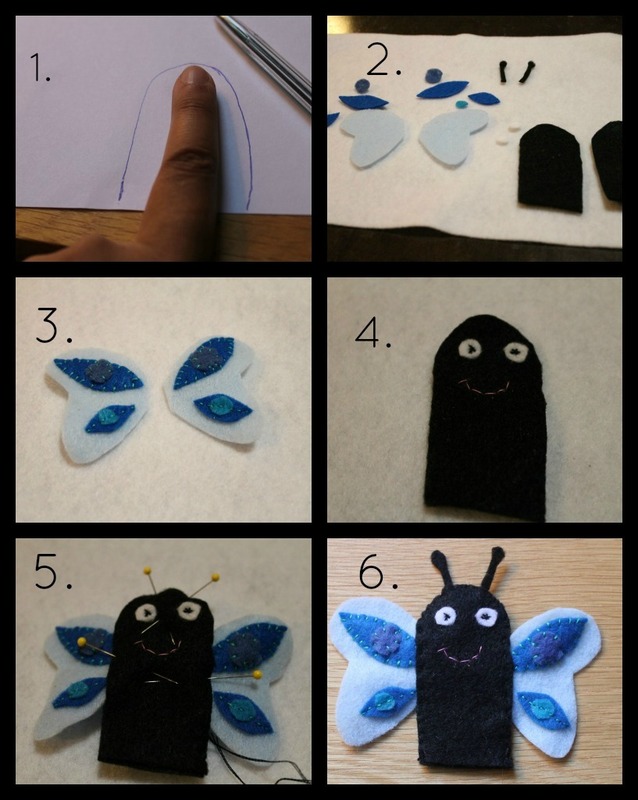 Sew on embellishments to wings/arms or body. For this stage I used mainly a whip stitch. 4. Add eyes and mouth. The mouth is a backstitch. I gave all of my puppets a bit of a smirk. 5. Pin all of the pieces in place, placing a body piece on the top and bottom. Once pinned, do a blanket stitch around the exterior using matching thread. Use a running stitch in places where arms/wings will not allow a blanket stitch. 6. Done! Dream up a story, and it’s playtime! Thank you so much for allowing me to share. Thanks again to Adrianne. I hope you have many happy hours of project creation! If it’s your first time visiting Small Things, I’d love for you to connect with me in some way! It’s long overdue, but I’m finally posting features from my Felt Food & Projects Roundup on OneCreativeMommy.com. Year great idea will be featured tomorrow. Don’t forget to stop by and grab a featured button! Finger puppets can be so expensive! I wish I had yours when my kids were a little younger! These are so cute! And you made so many of them! I’m featuring these tonight at the link party. Thanks for linking up!! Oh those are great. I wish I was better at sewing. Thanks for linking to the sunday showcase. These are so cute! Thanks for sharing. I love these! Since I’m sometimes not so creative, it’s fabulous that you shared so many photos of puppet ideas. I’m sure that my little girl will love these in a few months when she’s a wee bit older. So happy I found your blog from Lil Luna this morning, Nancy. Gorgeous, what a cute idea! Thanks, and thanks for stopping by! this are totally adorable, I should make some for my little class, they’d go mad for them. thanks for the idea. Thanks–and if you do make some I’d love to see how they turn out! So cute! That little elephant kills me. Thanks for the inspiration! Thanks–the elephant is my favorite too! Adorable! So fun and as someone who is purging closets right now I love that they take up hardly any space at all 🙂 Thanks so much for sharing at Mom On Timeout! Very cute. Alexa has a few finger puppets we bring to keep her occupied at church. I could also use a few more. Thanks for sharing at my Our Favorite Things Link Party. These are super cute! I’d love for you to come share this at our Pinteresting Party! I saw this post over at Happy Hour when you guest posted! I’m still in love with that little lion!! These are so sweet, and remind me of how much my kids loved finger puppets. We used to make our own mini table top theatres and have a great time coming up with stories. Oww–table top theaters! That could be a cool next project! Thanks for sharing! Oh my gosh your kids are going to be the happiest kids ever- what a great thing to keep them entertained! I would have totally loved this as a kid. Coolest mom ever award goes to you for sure! Just found your blog and have enjoyed getting to know you better. I’m excited to follow along! So sweet of you to stop by and write such a sweet note. I am headed over to your blog now! These are so cute. My daughter would just love them to death! My son sure love them. He especially loves to put them on his own fingers! How cute! My girls would love these. I worder if we could get the Mister to play along. Thanks for sharing! Thanks and good luck with the Mister!